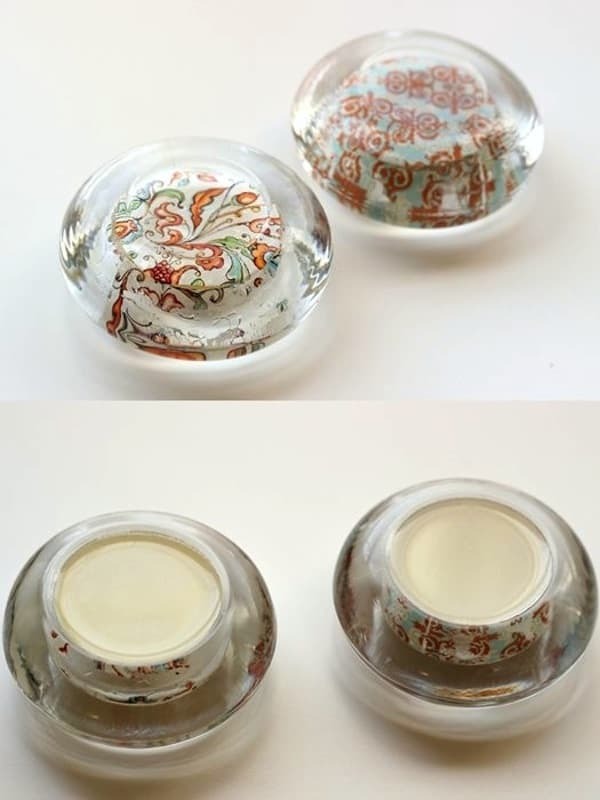 Create gorgeous, customizable DIY paperweights from dollar store glass candle holders! 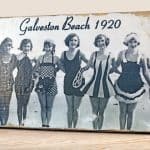 This easy project makes a great gift idea, and you can personalize! Hi! 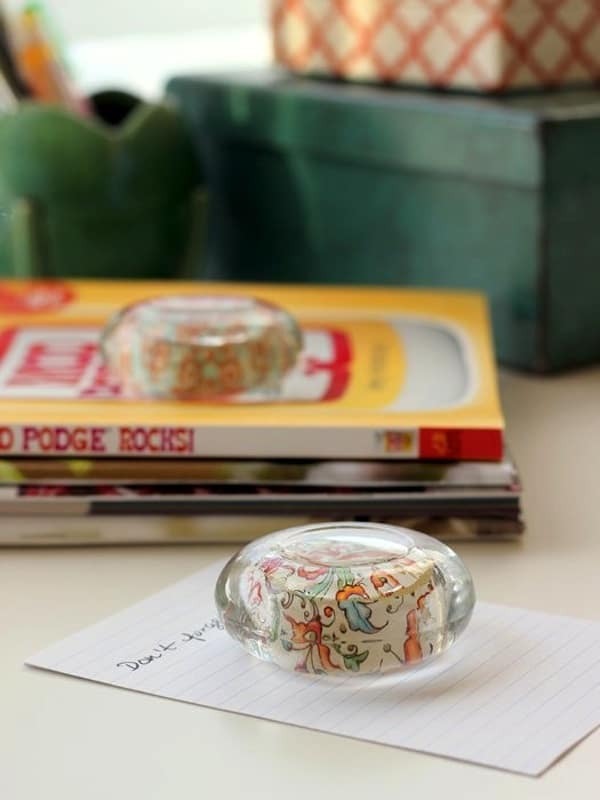 It’s Shannon from Rosyscription and today I want to show you a simple and inexpensive project: DIY paperweights. I don’t know about you, but I’m an avid dollar store junkie. 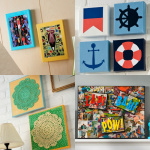 Next to the craft store, the dollar store is one of my favorite places for creative inspiration. I love going there just to look around for inexpensive craft materials. 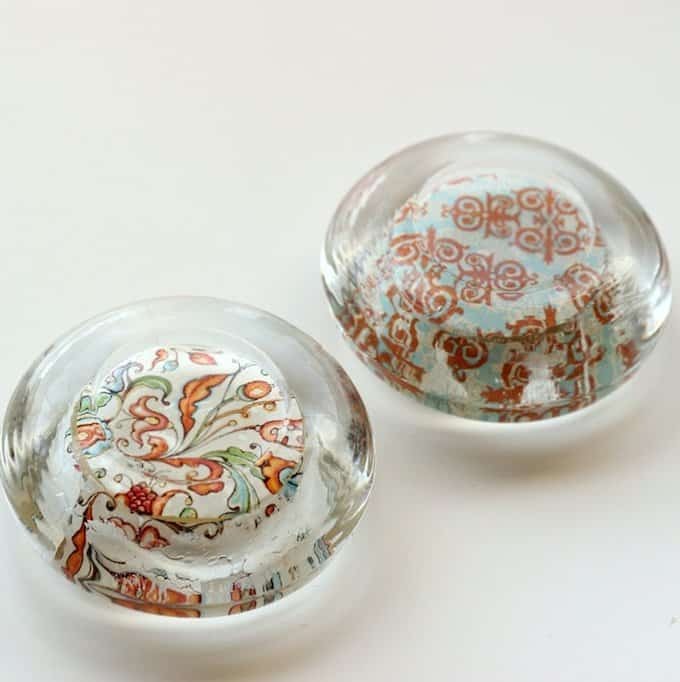 This month when I saw these shallow, rounded glass votive candles, I wondered if they could be flipped upside-down and decorated to make DIY paperweights. So, I grabbed a pack, got home and I made two paperweights in no time! All I needed was some scrap paper, decoupage and resin. I used pretty paper that I already had at home that would coordinate with the colors in my home office. 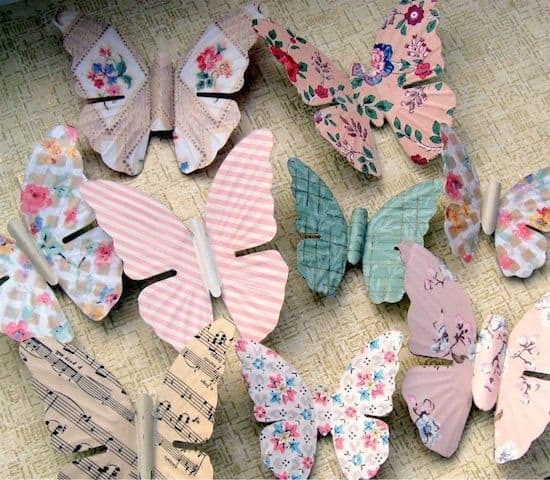 Want to make one for your desk or as a quick and easy handmade gift? It is so simple! Step One: Find a round object that is a similar size to the circular inset of the candle. 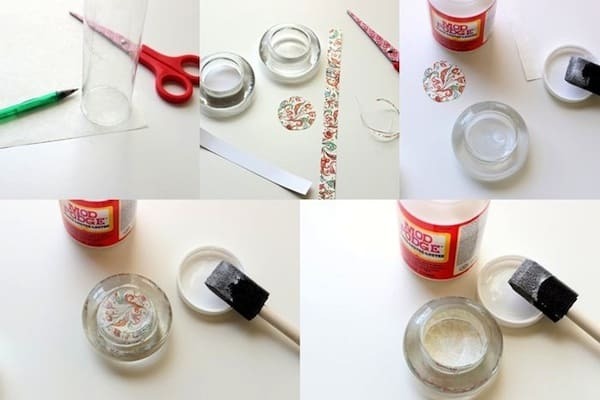 Trace a circle around the item and cut the shape out to fit inside the glass candle holder. Trim a strip of paper that will line the sides for the hole in the glass. 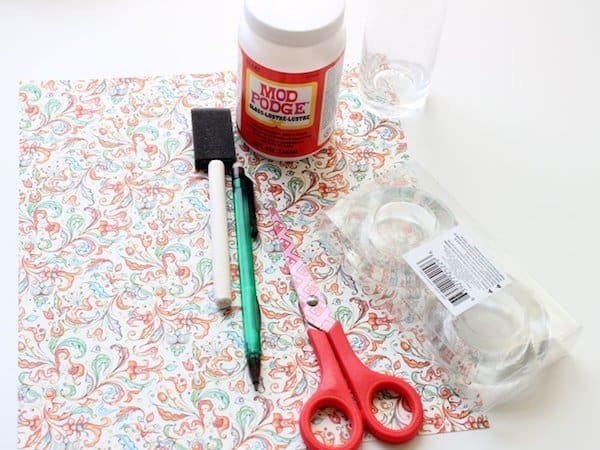 Step Two: Brush a thick layer of Mod Podge on the interior areas of the glass. Press the two pieces of paper (the circle and the strip) onto the glass, with the back of the paper facing you (the ‘good’ side should be facing outward through the glass). Smooth out any bubbles (they will be easy to see when you look through the glass). 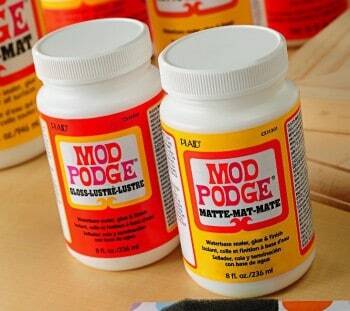 Once that dries, apply another thick coat of Mod Podge on top of the paper. Allow that to dry completely. NOTE: You can technically stop at this point and you will have a pretty, decorated piece of glass that will function as a paperweight. I chose to go a little further and fill that open cavity with resin so that the piece looked more finished. Adding the resin also added more weight to the object, making it feel like a heavy piece of glass. Step Three: Set up an area to pour your resin that is well ventilated. Read the directions on the box carefully. Wear the proper advised protection. 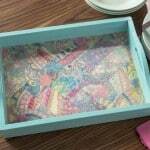 Mix the resin in a disposable container by using the two chemicals provided as directed by the manufacturer. The brand I used advised a 1:1 ratio. 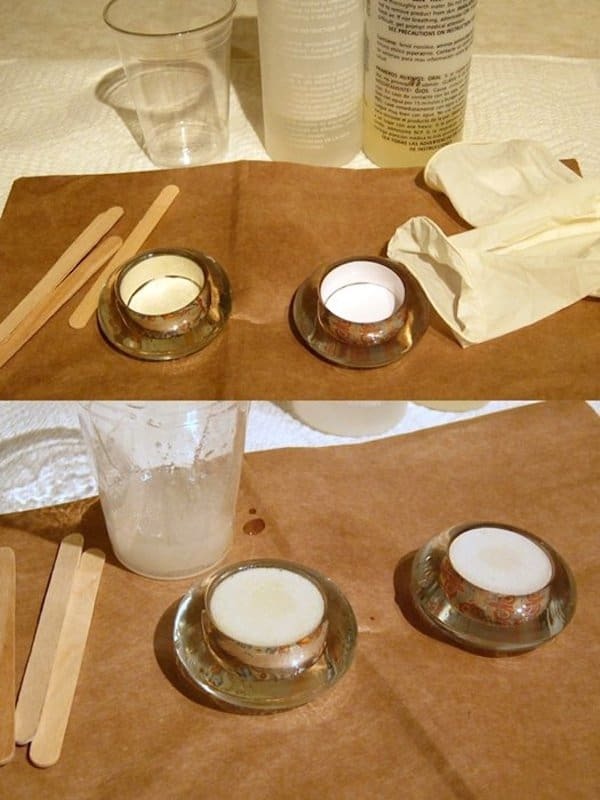 Stir and whip the mixture thoroughly (for about 2 minutes) and pour that solution immediately into the cavities of the candle holders. The resin mixture is self-leveling and bubbles will rise to the top on their own. But you can help eliminate the bubbles by breathing over the surface or using a propane torch. (The carbon dioxide, not heat, is what helps release the trapped air.) Allow the resin to harden and cure for at least 48 hours. Admire your pretty, new piece of “glass”! Here is a close up of the top and bottom of the two paperweights I made: If I had planned ahead, I could’ve embedded something cute inside the resin OR decoupaged more coordinating paper to the inside of the glass hole so the print would be visible through the resin. Oh well! I like that just the simple white back of the papers show through. 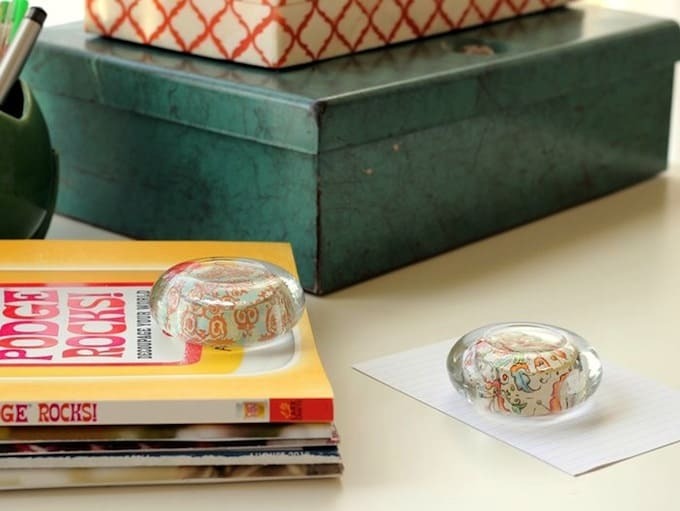 The possibilities for these DIY paperweights are endless! I think it would be cute to decoupage a circular photograph in the middle and then line the sides of the glass hole with pretty paper. That would make a great gift for any parent or grandparent. I can’t wait to get back to the dollar store again. I definitely need to pick up more of these glass candle holders. Plus, I never know what I will find or what will inspire me! This is totally adorable!! Love your project!!! I cant agree with you more about the dollar store being a place for creative inspiration. I just redid my bedroom window treatments. I took down the ugly curtains. I painted the curtain rod metallic green and hung dollar store feather boas with fish line and beads. It is so cute! I was thinking “photo!” from the first! Glad you mentioned that possibility. Who wouldn’t want to look at their darling kids’ faces on top of that pile of papers at work? Awesome idea. These look great. Love, love, LOVE this idea!!! Just a question though, will the paper fall out if I don’t have the resin??? I’m not so sure about the resin thing – especially with a 3 yr old that is literally into EVERYTHING!!! What an awesome idea! I love it!! 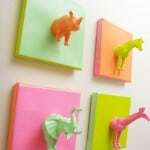 I’ll do this hand craft for sure!!! I’ll do many of them as a nice gift ! This is one of those “why didn’t I think of that?” crafts. I have some heart shaped rocks that I’ve been wanting to make into paperweights. Thanks for the idea! What a cute idea, just one question. What type of resin did you use specifically? And where did you buy it?